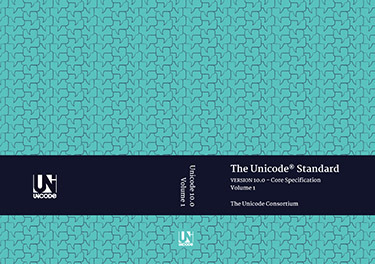 The Unicode Consortium is pleased to announce the new design selected for the cover of the forthcoming print-on-demand publication of The Unicode Standard, Version 10.0. The Unicode Consortium issued an open call for artists and designers to submit cover design proposals. All submitted designs were reviewed by an independent panel. The selected cover artwork is an original design by Kosala Senevirathne, art director and graphic designer at Mooniak, a design and art direction studio in Colombo, Sri Lanka, that focuses on multilingual design. The design is about the spirit of Unicode Standard; a universal standard that enables equal opportunity for discussion and discourse in writing systems of the world. Two runner-up designs by Diana Gomez and Maitray Shah were also selected. Diana Gomez is currently a senior in the Mechanical Engineering at the University of California, Berkeley. Maitray Shah is a graduate student at San Jose State University pursuing a Masters in Software Engineering.